Jamie Foxx cuts an Obama-ish figure as President Sawyer in White House Down, the second of two Hollywood action films this year to put the Die Hard template in the White House. Unlike Olympus Has Fallen, the terrible spin on this scenario from earlier this year which found an unlikely group of rogue North Koreans simply shooting their way into the building, this picture finds a far more insidious coalition of bad guys with richer and marginally more believable resonance. The president’s under literal attack here by an organized team of villains made up of hawks, Islamophobes, white supremacists, right-wing conspiracy theorists, and threatened corporate interests. They start by quite literally exploding apart the deadlocked legislative branch as a distraction before quickly moving to take over the White House, holding the cabinet secretaries and an unfortunate tour hostage. But they didn’t count on one of the tourists being an off-duty capitol policeman played by Channing Tatum. He was there with his political junkie 11-year-old daughter (Joey King), but now he’s loose with the president, trying their best to make it out alive and regain control of the country. The script by James Vanderbilt borrows liberally from the Die Hard template, from the crisp setup that quickly moves the everyman lawman and team of villains (Jason Clarke, Jimmi Simpson, and more) into place, to the family member amongst the hostages, to the escalating stakes, time spent clambering up and down elevator shafts, a henchman who likes Beethoven music, and an only sometimes helpful collection of agents, officials and policemen (James Woods, Maggie Gyllenhaal, Richard Jenkins, Lance Reddick, Michael Murphy) communicating via walkie talkies and cell phones. Unfortunately, the sense of destruction feels slightly out of proportion for the rather modest little action film that’s developing. It’s not as bloody and ugly as Olympus, but seeing thousands of rounds of ammunition expended during a rather silly car chase on the lawn of the White House dulls the impact of the violence. It’s one thing to see the dome on the Capitol Building collapse, an event that feels too real in presentation, but then why back into punches and punchlines then cut away to linger on an unseemly shot of an airplane disintegrating? It’s so often so juvenile and small it feels insensitive to ratchet up the massive damage elsewhere. The stakes often feel very real and personal, but the excessive bombast of it all distracts. But excessive bombast is what director Roland Emmerich is all about. It works in his big splashier disaster movies like 2012 and The Day After Tomorrow and here he proves that he can still scale things back to a more contained set piece when he wants to do so. But it's hard for him to stay small with a script like this. The film is patently preposterous right down to its literal flag-waving conclusion and Emmerich’s such a straight-faced spectacle showman that it almost works. He blew the whole White House up with one swift alien blast in Independence Day. Now he returns to the scene of the crime to spend over two hours torturing the poor place. Grounding the film is Foxx and Tatum, who keep the ridiculous on some recognizably human terms as they race around the house engaging in an almost-all-business relationship that has time for both bonding over the hardships of fatherhood and firing off the occasional snappy one-liner. They’re charming actors and the chemistry between them is natural, easy, and appealing, which is good, since they spend most of the movie alternately hiding from and shooting back at bad guys together. In a nice touch, Foxx puts on his reading glasses before shooting down his first bad guy. It’s like what might’ve happened if Reginald VelJohnson was stuck in Nakatomi Plaza with Bruce Willis instead of stranded outside. I liked White House Down best when it gave in to its dumbest, broadest impulses, letting reasonably diverting action or genial banter carry it all along. At one point during the climactic action, a big red countdown clock reads 8 minutes until Very Bad Things happen, but characters scramble around for what felt like easily twice that length while the clock slowly ticks down its eternal seconds. That’s funny in an enjoyable stupid blockbuster way. But every time we get bogged down in the increasingly apocalyptic stakes outside the building, some energy gets sucked out of the plotting. Add to that the constant need to yo-yo Tatum’s daughter in and out of danger and the back half of the film grows increasingly grating and uncomfortable. Around the 100-minute mark I would’ve been ready to enjoy a cathartic climax, but after another half hour ticks by, I was just ready to leave. I was rolling with the ridiculous, but every time I was asked to take the events seriously, I felt myself sinking in my seat. I did like how the inciting incident of the plot seems to be the president’s proposal of peace in the Middle East, the prospect ironically getting all the baddies riled up, but so much of the film is playing with politics in awkward ways that get blown all out of proportion by the damage on display. A shorter, less trigger-happy version of the film would’ve been better, but at least in its current form it’s still the year’s best Die Hard movie in a year that had an actual Die Hard movie. That’s less of a compliment than it sounds. If nothing else, the new buddy cop comedy The Heat proves that some standard movie formulas can still work if done well. Just reading the phrase “buddy cop comedy” probably already has you thinking it’ll have the tough boss who puts together two dissimilar police officers. The pair will, after initial tension and hurt feelings, learn how to work together and then even to like each other, maybe. There’ll be bonding and bullets and it’ll all get wrapped up with plenty of laughs along the way. Well, you’d be right. But The Heat does it all with plenty of likable energy, reasonably involving plotting, and two terrifically appealing lead performances. And the formula works once again. To this typically masculine subgenre, director Paul Feig, of Bridesmaids, and screenwriter Katie Dippold, a writer for the terrific sitcom Parks & Recreation, bring a welcome pair of roles for women. Sandra Bullock and Melissa McCarthy play the cops around which the story is built. They’re not only operating within the usual bounds of the good cop, bad cop positions, but are playing variations on their typical character types as well. Bullock plays one of her professional women who gradually loosen up and let others into her life without sacrificing the quality of her work. McCarthy plays one of her tornados of profanity and peculiarities, the goofball with hidden depths. These two hugely appealing actresses are good at playing these kinds of roles and here have fun chemistry with one another. They’re a natural pair. Their differences and similarities fit together nicely, operating on compatible wavelengths from which genuine warmth is formed. Bullock, tightly composed and snappily determined and McCarthy, confidently messy, make quite a pair. Bullock’s character is an F.B.I. agent who arrives in Boston hot on the trail of a mysterious drug lord. McCarthy is the initially off-putting local detective who bristles at the thought of some outsider telling her how to do things in her town. Everything you need to know about the characters you can tell by their wardrobes. Bullock dresses exclusively in conservative pantsuits, while McCarthy wears ratty t-shirts and a well-worn vest. They couldn’t be more different, which makes their progression from initial antagonism to reluctant partners satisfying. Though there’s plenty of room around them for character actors to play cops (Demián Bichir, Marlon Wayans, Taran Killam), criminals (Spoken Reasons, Michael McDonald), and locals (Jane Curtin, Michael Rapaport, Bill Burr), it’s basically a two-woman show. Asides acknowledge the difficulty of being a woman in a typically male-driven profession, but that’s wisely kept subtextual. They’ve got a job to do, proving their capability with results. What makes The Heat work so well is the way it looks like a cop movie, crisply barreling down an investigation that takes some satisfying twists and turns, but moves like a star-driven comedy. In scenes of interrogations, analysis of clues, and meetings over strategy, Feig’s direction and Dippold’s screenplay serve both cop and comedy sides of the film equally, ratcheting up the stakes and dumping exposition while letting their leads’ clearly-drawn personalities bounce off of each other in appealingly prickly confrontations. They throw their whole bodies into showing the other who’s the real boss of the situation, to the point of spending way too long trying to push each other out of a doorway for the small victory of being the first one to a suspect’s apartment. To compete with each other when they’re both equally driven to catch the drug lord is ridiculous and they know it, but they simply can’t help themselves. That’s what drives the comedy: irrepressible professional pride leading to surface level conflict that inevitably reveals the affection we knew all along they could find. It all comes down to the inevitable stakeouts and shootouts the genre requires, but because it’s been such a pleasure to see these two cops snap at one another and grow close to one another while being, for the most part, good at their jobs, it’s easy to get involved in their plight. There are big splashy gross-out moments of stabbings and tense gun-wielding stalemates, but plenty of laughs as well. When Bullock and McCarthy flail about undercover in a nightclub, it’s more funny than tense, but later a scene that starts with an amusing buzzed night out and ends with the two barely escaping certain death is suddenly more dangerous than funny. (Though McCarthy gets a good laugh out of the moment as well.) The film keeps both plates spinning. It may be more or less exactly what you’d expect out of a buddy cop comedy, but we haven’t had a good one in some time. It is formula played in such a way that it doesn’t feel stale. And it’s not often that a Hollywood production is so nonchalant about telling the story of two women in the context of a formula picture, which makes it all the more refreshing. The true story of L.A. teens from comfortably affluent families burglarizing the homes of celebrities is a big fat satirical target, but Sofia Coppola is too empathetic a director to get too savage with her filmmaking. In The Bling Ring she approaches the subject with tenderness and understanding, creating a vivid look into vacuousness. No frivolous froth or hysterical cautionary tale, this is a film that's concerned deeply about shallowness without condescending. (Well, okay, it's more like "rarely condescending.") Even if Coppola takes shots at their societal surroundings, she doesn't knock the kids themselves or the celebrity targets, some, like Paris Hilton, making brief cameos playing themselves. It’s a film that’s often very funny, not because it’s mean-spirited, but because it acknowledges the inherent seriousness of the silliness in which the characters find themselves, a fact that escapes them for much longer than you’d expect. The film focuses on a group of stylish high schoolers who conflate brand worship with aspiring towards celebrity. They see the kind of famous represented by being a socialite in a dubiously real reality show like The Simple Life or The Hills and access to prestige brands that can be gained by it. Not actual prestige, mind you; the brands are all they’re after. These are kids who live in a town of celebrity and glamour of one kind or another. They spend their lives so close (and yet so far) to the lifestyles of the rich and famous. We see they’re frequently at a club Hilton, Kirsten Dunst and "a producer of Entourage" frequent. This group of kids takes advantage of the proximity of celebrity and the ease of information access to do something so simple it’s amazing no one had thought to take advantage of it before. They’re pioneers of a sort. The addresses of the stars are a Google away, as is news of the celebrity travel plans and social engagements. At the core of the film are the ringleader (Katie Chang) and the boy (Israel Broussard) who has a crush on her and is drawn into her world. First, she opens unlocked cars and lifts money. Then, she moves on to wandering into the mansions of vacationing classmates. Soon, she, he, and eventually a small group of friends, go on riskier, more frequent trips, loitering in empty homes of Hilton – she’s a favorite – and Lindsay Lohan, Audrina Patridge (a star of The Hills), Orlando Bloom, Megan Fox, and Rachel Bilson as well. There’s a sense of mob mentality slowly bubbling up out of group dynamics as the crime escalates with more and more brand-name purses, dresses, shoes, and shades lifted from the target mansions. They’re showing off for each other, grabbing talismans of cultural currency and imagining they have the lifestyles they feel they deserve. Coppola and her cinematographers Harris Savides and Christopher Blauvelt (who took over after Savides passed away) take a dynamic, but composed approach to shooting these antics. I particularly loved a static wide shot of a glassed-in home at night, rooms lighting up with the intruders scrambling in. There's little Ocean’s Eleven pleasing fizzle or Bonnie and Clyde tonal whiplash here. Their capers are coldly presented. What at first seems a surprising crime is drained of its surprise through repetition of the act - the home invasions are frequent and similar - and a camera that observes rather than sensationalizes. It’s all shiny surface, shallow, brightly lit by day, by night, vivid montage, the big houses cool oasis in humid darkness. The perspective from which Coppola views the events is easy and restrained, comfortable watching and cataloguing the goings-on. She’s objective, but hardly disinterested. The deceptive emptiness of the filmmaking sometimes makes this a hard film to enjoy, but a rich film to reflect upon. The Bling Ring itself is made up of characters who seem like real kids, with some of the dialogue sounding so true in a you-couldn’t-write-something-so-perfectly-oblivious way that it could be plucked right from depositions and the reality show that a few of them would in real life end up on. The acting is loose and natural. Especially good are Taissa Farmiga, who played the troubled teen in the first season of American Horror Story and Emma Watson, Harry Potter’s Hermione. Used to playing smart young women, they prove themselves more than ever to be smart performers as well. Playing these rich California girls, they let their eyes go blank and accents drawl into Valley Girl stylings. They, as well as the other girls (Claire Julien and George Rock, in their debuts), blend together in the crowd scenes, all of them aspiring to stand out by fitting in. (That old chestnut.) The group is full of performances impressively inhabited. All the kids have a kind a vacant babbling, but it’s not limited to them. A mother played by Leslie Mann, the only one we more than glimpse here, has a pop pseudo-philosophy Secret-inspired homeschooling curriculum built around dream boards, wishful thinking and Adderall. Coppola's film is an empathetic critique, even when the walls of justice, as represented by cops, lawyers, and judges, close in on the group. What felt consequence free for so long is suddenly not. The character played by Watson gets the last word, her character shamelessly promoting herself right up to the credits, claiming the crimes were a great “learning lesson,” and trying to put in a plug for her website. It had me thinking of Repo Man’s famous death scene of a white suburban punk in which the teen says "I know a life of crime has led me to this sorry fate, and yet, I blame society. Society made me what I am." 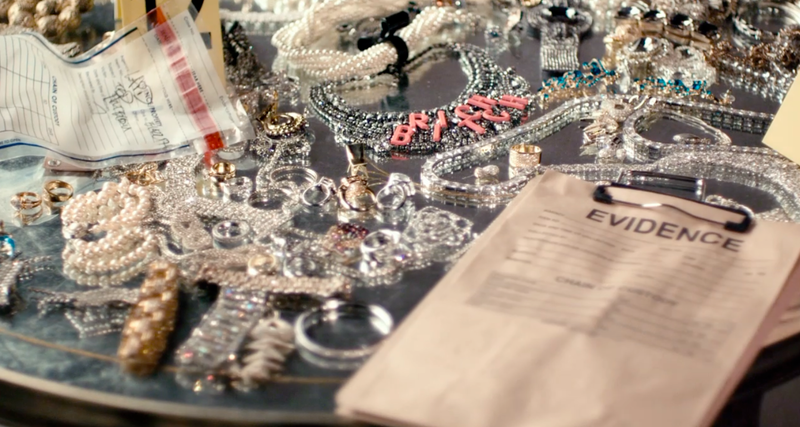 The Bling Ring doesn't allow its characters this satirical insight. Society made them what they are and they'd greedily lap up the attention as long as society would mention them in the same breath as the people from whom they stole. They’re kids for whom being famous is to have your face on TMZ and so infamy gets you just as far. Hollywood’s latest rehearsal of total worldwide destruction is World War Z, a globetrotting zombie film that approaches the zombie problem as a plague to be contained and cured. It has more in common with the techno-thriller novels (turned films, usually) of Michael Crichton – Jurassic Park, The Andromeda Strain – than the gross-out shock satire horror films of George Romero – Night of the Living Dead, Dawn of the Dead. In the detail-oriented, goal-driven throughline, we follow a representative of the United Nations played by Brad Pitt travelling through countries ravaged by zombie attacks hot on the trail of Patient Zero and, hopefully, a way towards understanding the outbreaks in order to stop them. The film is grimly satisfying, hopping from one nice suspense sequence to the next, treating the destruction soberly and the stakes with a sad weight. It works because of the humane star power of Pitt. He’s playing a role that Robert Redford or Warren Beatty would have played if it was made in the 1970s with, say, Alan J. Pakula or Sydney Pollack behind the camera. Pitt’s aged into a still, strong, warm everyman persona very well. In this film he’s a man defined by his profession, a humanitarian, and his family, a wife (Mireille Enos) and two daughters (Sterling Jerins and Abigail Hargrove). His crisis-activated goals dovetail easily. He wants to keep his family safe and stop the developing worldwide calamity as best he can. That’s easier said than done, which gives us more than enough reason to root him on as he reluctantly leaves his family in the care of a refuge ship and flies around the world in a military plane, stopping in various countries, trying to trace the outbreak back to its source. At each stop, zombie attacks are inevitable. He meets character actors (like David Morse, Peter Capaldi, and Fana Mokoena) with helpful information (or not) to impart and traces the mystery as far as he can. Then zombies swarm into the picture in moments built out of small jolts and massive setpieces, and we’re off to the next stop. Loosely based on a novel by Max Brooks, the film’s troubled production caused it to take on screenwriters like a sinking ship takes on water. The end result gives story credit to such heavy-hitters as Matthew Michael Carnahan (The Kingdom), Drew Goddard (Cloverfield), Damon Lindelof (Lost), and J. Michael Straczynski (Babylon 5). That makes it hard to say who I should credit with coming up with tremendously effective sequences like the opening in downtown Philadelphia in which a traffic jam erupts in violence, or the late-night rainstorm attack on a darkened runway, or the scene in which a tidal wave of zombies scramble like ants against a protective wall meant to keep them out. Director Marc Forster, used to helming prestige dramas (Finding Neverland), likable mainstream oddities (Stranger Than Fiction), and widely disliked Bond films (Quantum of Solace), along with editors Roger Barton and Matt Chesse, have somehow created a film that’s slick and propulsive all the same. Some combination of rewrites, reedits, and reshoots has left the film shiny and slick, with little evidence of behind the scenes squabbles. Creepy and overflowing with horrifying imagery both on-screen and, more often, implied, World War Z has such an overwhelming approach to its devastation that it’s wise to keep it small on a scene to scene basis. We get the impression that calamities are occurring without needing endless shots of total disaster to understand. (Though there is one of those big disaster-movie control room maps that light up the biggest problem areas in red. I always like picking out my area of the country on those things just to make sure I’d be caught up in any given mess.) As we dash around the world following the main mission, I appreciated the matter-of-fact global respect on display here as characters from different countries and backgrounds get to be real people instead of stereotypes. Also appreciated is the way in which the filmmakers understood and valued the effect of the large-scale havoc they conjure. It’s not cheapened into a tunnel vision hero’s tale with collateral damage brushed aside as long as the wife and kids are fine in the end. The burden of stopping this plague weighs heavy on Pitt’s shoulders. And this is no usual zombie plague of shuffling undead. The zombie effects are modern and twitchy, the once-human creatures swarming like deadly insects and chattering their dead jaws with bone-snapping sound effects. This makes for a primal, animalistic dread in their heavily-CG pack behavior, but it’s never mined for the kind of body-horror, living-dead drama so successfully vivid in Romero’s films or Danny Boyle’s 28 Days Later and its sequel. Here the zombie virus is nothing more than an existential threat. It could be anything, even the flu of Soderbergh’s Contagion or the aliens of Spielberg’s War of the Worlds. In fact, WWZ often plays like a clever cross of those two better films. But it’s also a competent success all on its own, a kind of gripping summer blockbuster that kicks up a great deal of mood and suspense in moments intense and frightening, before fizzling out slightly into the end credits. The effect doesn’t linger, but it’s strong and engaging enough while it lasts. The biggest problem Pixar has is an imbalance of expectations. Back five or ten years ago, when they were in the middle of a string of masterpieces – Wall-E, Up, Ratatouille, The Incredibles, among others – they seemed like a studio that could do little wrong. They released one gorgeously animated, surprisingly moving, and hugely satisfying movie after the next and for a while it seemed like that would always be the case. Now, after a string of merely enjoyable entertainments that not only weren’t heartbreaking works of visual inventiveness, but also rarely were working towards that goal, some have started shrugging off Pixar films as somehow less than adequate. As if expertly calibrated mass appeal crowd-pleasers are a thing of which we have an overabundance these days. 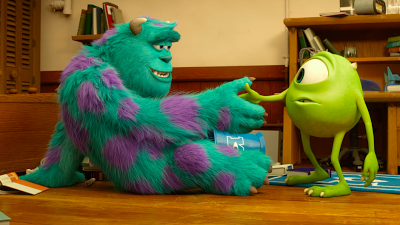 Pixar’s latest is Monsters University, a prequel to their 2001 hit Monsters, Inc. This setting, a world of monsters in which all energy comes from scream power generated by sending creatures through portals in the shape of children’s closet doors, is Pixar’s most colorful and cartoonish. The design features an appealing bunch of candy-colored monsters, likable and vaguely frightening in the right light with the right sound design. They’re more cute than creepy, like smoothly animated Harryhausen characters inspired by one part Hieronymus Bosch, three parts Hanna-Barbera. The first film introduced us to the exceedingly endearing pair of Mike, a one-eyed green ball with the voice of Billy Crystal, and Sully, a furry blue bear with the voice of John Goodman. Together they were the best scarers in the business. Rather than attempting to build further narrative after the events of that film, which has a story that tidily fixes all that world’s major problems, we’ve wandered back in time with a charming prequel. This new film rewinds to find them college freshman. This proves to be a fruitful move. Though their emotional arc from competitors to best friends is obvious, doubly so by knowing where they must end up, there’s plenty of bright, funny detail to fill up a film that uses the setting to great effect. The simple design details that go into fitting a college campus into this world alone provides plenty of delight. There are all the typical sights, from dorm rooms to classrooms and parties to parks, that you’d find in any college town, which makes the monsters roaming the halls and down the quad so appealingly strange and oddly familiar. They may have tentacles or three heads or breathe fire and are training to burst through your closet door roaring for a scream, but they still have to pass their exams and wonder if they’re cool enough to go to the party down the street. Monsters: they’re just like us. Intimidating Dean Hardscrabble, Helen Mirren voicing a huge centipede with bat wings and a lizard face, introduces the annual Scare Games, a campus wide competition to prove who is the best student scarer. 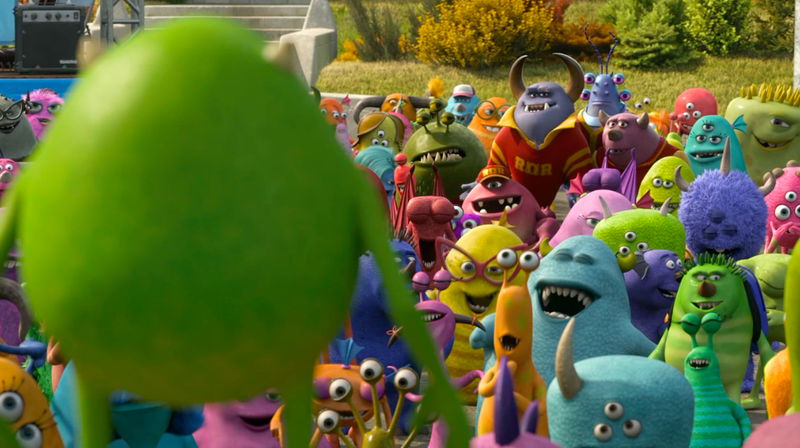 Mike and Sully both throw themselves into the competition with much to prove. The screenplay from Robert L. Baird, Daniel Gerson, and Dan Scanlon (who also directs) smartly makes Mike an underdog who has studiously worked his way into the University while Sully got in on a family name and big expectations. You can see their academic approaches in their postures, a nice subtle flourish of animation. There’s an interesting tension between them, but they also both have a lot to lose. To win is to remain in the scaring program. That makes it hard to be saddled with a team of adorable goofballs, the kind of ragtag group that fills out an instantly loveable ensemble: a pudgy middle-aged student with nerdy glasses and a Ron Swanson mustache (Joel Murray), a nice guy (Peter Sohn), a two-headed dance major (Sean Hayes and Dave Foley), and a hairy weirdo (Charlie Day). Why, they’re not as scary as the overconfident frat guys or the hissing sorority sisters. What hope does Team Oozma Kappa (great name) have? Even their team chant - "We're OK!" - leaves something to be desired. With the competition, a sort of Triwizard Tournament for monsters, effectively turning the whole film into Pixar’s typical mad-scramble racing, chasing climax, the whole thing speeds right along. Through various challenges and obstacles that are cause for fun visual gags and impressive creature design, the zippy energy rarely flags. The film seems to take its cue from the rousing rat-a-tat drumline-driven fight song that Randy Newman has cooked up for the film’s setting, an expert clack of moving percussion parts playing in perfect, driving syncopation that powers the score. Monsters University is a lot of appealing parts played with great skill and falling into place with great precision. It’s a lively, funny G-rated campus comedy that’s been executed with beautifully detailed animation and a great deal of energetic momentum. It’s frame for frame the best-looking American animation since, well, the last Pixar film, and deals lightly and generously with some nice themes about being yourself, studying hard, and remaining honest and kind. The talented team behind the film has cooked up something special, harmonizing with the tone of the earlier film without relying solely upon our memories of it and filling the screen with plenty of visual whimsy to admire. 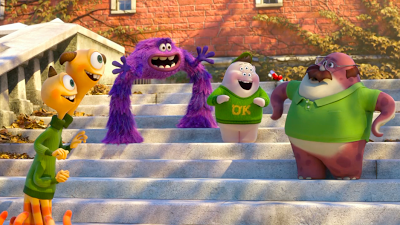 Monsters University may not match the emotional heights Pixar has proven capable of reaching. It doesn’t even come up with one sequence as good as its predecessor’s madcap chase through a rollercoaster of magic doors, but it’s still a film filled with delights. It has so many moving parts, endearing characters and visual pleasures – and pulls them all off so effortlessly – that it could be easy to scoff, as if such proficiency were easy to come by, as if other family films didn’t struggle to pull off even one of these goals. When a whispering librarian becomes a looming monstrosity when provoked by the slightest noise or an eager monster reveals the scaring techniques he’s studied are what we’d recognize as standard haunted-house horror movie tropes, there’s undeniable appeal. This film’s a two-hour smile and a likable echo of one of the studio’s earliest triumphs. Who’d want to turn down that offer? Even when working with a smaller emotional range and simpler plot, in a film that isn’t necessarily calibrated to make adults cry, Pixar is working with a whole different palate than their closest competitor. I wouldn’t trade one so-called minor Pixar effort for all the Ice Age and Madagascar movies in the world. Richard Linklater is one of the best directors working today, a fact often easily neglected simply because he never seems to be showing off. His films are so expressive and confident that they have no overtly showy facets. And yet, hopping genres effortlessly, in films as diverse as Waking Life, School of Rock, and Bernie, he creates films with gorgeous visual subtlety, sparkling dialogue of ever-so-heightened naturalism, and casually rigorous observational power. Unlike a Spielberg, Scorsese, Tarantino, or Coen brother, Linklater doesn’t wear his virtuosity on his sleeve. He doesn’t and doesn’t have to. He’s simply that good. His latest film is Before Midnight, a follow up to his 1995 masterpiece Before Sunrise and its just-as-great 2004 sequel Before Sunset. The first film, tender and romantic, introduced us to Jesse (Ethan Hawke) and Celine (Julie Delpy). In their early twenties, serious and impulsive, they happen to meet on a train crossing Europe and strike up a flirtation. On a whim, Jesse decides to ask her to get off with him in Vienna and spend some time getting to know each other before he has to catch a flight back to the States. Celine, who is on her way back home to Paris, agrees. Together they wander the streets the whole night, engaging in one long winding conversation that’s hopeful and hesitant, offhand and playful. They part without exchanging numbers, left with only memories of one chance connection. They meet again nine years later. Now he’s a writer on a book tour. His last stop is Paris. She read about his book signing and shows up. They spend the next several hours walking and talking, catching up and wondering what might have been. There’s a moment in Before Sunset in which Hawke looks away and Delpy reaches out to touch his head with her hand. She hesitates, then moves her arm back to her side. It’s an echo of a scene in Sunrise that finds the two of them sitting in a record shop listening booth, shifting their positions and gazes ever so slightly to look at this new person without getting caught doing so and risk letting on just how interested they are in the other. These are films filled with lovely gestures that catch the experience of hesitation in romanticism, where the potential for love eludes for no particular reason other than a pause between total connection and complete comfort. It has been nine more years, for them and for us. Before Midnight finds them once again spending time together, this time in Greece. Because part of the fun of this new film is finding out what has transpired between them since we last saw them, I’ll avoid specifics and instead focus on the emotions of it all. When they were first on screen together in 1995, they were young, their lives ahead of them. The connection they made was based on philosophies and personalities. When they met again, they still enjoyed talking art and politics, but now as adults in their thirties, experiences, insecurities, and practicalities entered the picture. Now their conversations are richer and longer, not better, but the product of passing time. Their relationship has changed, even as they engage in conversations around the topic of change, around what they have done with their lives and how much time may be left. There’s a mortality and morality added to their decisions that youthful romance had no time for. These exceedingly truthful films have not grown smarter, but more knowledgeable as these characters have aged. This is a rare Hollywood romance that’s swooningly sensitive, prickly and intimate, in full acknowledgment that a relationship is an evolution that must be cared for and maintained. Differences grow, and so do commonalities. Jesse and Celine, smart, articulate people, have devolved both comfort and conflict so that, as we listen to them, we can watch rhetorical missteps and argumentative fallacies rise up on both sides, and fade away, or not, as the conversations continue. Unlike the earlier films, relatively trim 80-minute affairs, Midnight runs nearly thirty minutes longer. Rather than one long conversation, this one is loosely structured around three: the first in one unbroken shot through the dashboard of a car, the second around a dinner table with friends, the third down the streets of a Grecian village and into a more private space. What we see play out is nothing less than a virtuosic duet between two actors who have lived with these characters for almost their entire careers and allow their characters’ histories and personalities to fully inform each and every exchange right down to the diction. Hawke and Delpy co-wrote the screenplay with Linklater, who, in his direction, unobtrusively sits with these characters and lets them puzzle through deep thoughts, shallow reactions, ambiguous emotions and complicated concerns. It’s a patience few films allow and which reaps only rich rewards here. The product of generous collaboration, Before Midnight draws upon a rich fount of subtext and backstory to sketch out another period of time with these people. What started as one affectionate, extraordinarily literate and perceptive indie picture has grown into a three-part small-scale epic about two lives that have intertwined over a nearly twenty year period. It’s a film that’s unblinkingly honest and achingly intimate, and yet all the more romantic for it. It is as funny as it is sad, as warm as it is raw, as comfortable as it is candid. It feels honest and real because Linklater is so humane a filmmaker and his actors so flawlessly genuine. Here’s a film that doesn’t look away for one second in considering the messy emotions between two people who’ve known of each other for a long time. And here’s a film that makes the work of a relationship look worth pursuing. Find people, find someone, you like talking to, the film seems to be saying, and your life can’t be all bad. Great conversation, like great films, like great art, is worth finding and cherishing. This is a great film. There are superheroes I enjoy more as characters, but none I enjoy more as resonant myth than Superman. He is an icon, a titan, a God. He’s Greek myth, Messianic, a Shakespearean conflicted hero, a piece of Americana and refutation of it. He’s not merely a superhero; he’s the superhero. And so, like the rarified company in which this character can be placed, his story is one worth retelling and one that can survive a bad telling. In Richard Donner’s 1978 Superman and its first sequel, a light touch to the myth was sunny and inspiring in its classically endearing earnestness that flirts with corniness without giving over to it. By the time the blue-suited, red-caped hero flew back to the silver screen care of Bryan Singer in the retro-modern stylings of 2006’s Superman Returns, he was suffused with regret and longing in a film that’s both mature and lyrical. Now, with Man of Steel, he’s back, this time in the hands of Zack Snyder, director of 300 and Watchmen. He’s a generally talented visualist who ramps up the surface spectacle and brings admirable weight to the myth before sinking into the same lumbering traps that so many modern blockbusters settle for. It starts, as it must, with the birth of Kal-El, last son of Krypton, born in the final days of his planet’s existence. His father (Russell Crowe) and mother (Ayelet Zurer) send him away in an escape pod that crashes on Earth. There, the yellow sun and rich atmosphere give the alien, who to all appearances looks human, powers of strength, flight, and speed, among other superhuman feats. He’s faster than a speeding bullet, more powerful than a locomotive, and can leap tall buildings in a single bound. From a distance you just might mistake him for a bird or a plane. Nope. He’s Superman. But not right away. The script by David S. Goyer, from a story he co-created with Dark Knight auteur Christopher Nolan, cuts between a lost young man searching for evidence of his identity and a little boy scared of what these strange abilities mean for his life with his adoptive parents (Kevin Costner and Diane Lane). In the fractured chronology, we catch glimpses of important moments – discovering his powers, saving people, wrestling with his sense of purpose – building towards the crescendo that is the unveiling of the man we’ve been waiting to see. I find the Superman origin so deeply moving and archetypically resonant that the glimmering, artful opening passages of Man of Steel are an often stirring experience. Snyder and his team emphasize the alien in the story, focusing on what isolates Clark Kent in the days before his Superman identity. As a young boy his powers are strange. He’s not sure to what use, if any, he should put them. They scare him. As the origin story starts to fade, villains, in the form of exiled evil Kryptonians led by General Zod (Michael Shannon) arrive on Earth demanding to meet Kal-El or else. Between an identity crisis on a galactic scale and otherworldly villains, this is less a superhero movie as we’ve come to understand them, more an alien invasion space opera, dark, complicated, and endlessly explaining itself. Krypton’s a fantasy world (like something out of Star Wars or John Carter) brought into conflict with our world and Superman must choose which to save. It should be a real struggle, but the film makes it awfully clear for the man which way to go. He doesn’t have to decide to be a hero; the decision is forced upon him, no matter how heavily Snyder underlines the Gethsemane moment. The film is expertly cast and beautifully shot – though the action is sometimes barely contained by the frame – full of the story beats one would want out of a Superman movie. It purports to tell the story of Superman, but eventually it becomes clear that it has skipped out on deeper characterization. As Clark Kent/Kal-El/Superman Henry Cavill fits the suit and fills the angst, but he’s otherwise a symbol. It’s a demanding, unforgiving task and he handles it well. In the supporting cast, great actors show up in roles we recognize and the film’s attempt to flesh them out mostly stops there. Amy Adams plays Lois Lane. Cultural osmosis tells us she’s a smart, capable, Pulitzer-Prize-winning reporter at the Daily Planet and the movie follows suit. As expected, she takes an interest in this Superman story. Her tough-but-kind editor is Perry White, played by Laurence Fishburne, so wonderful you wish he had something more substantial to contribute to the plot. There’s endless fatherly gravitas from both Crowe and Costner (his casting alone causes the farm scenes to play off of Field of Dreams echoes) and Lane is a beacon of maternal warmth. Shannon, all crazy-eyed, gargling intensity with each barked shout, makes for a good hateful villain. And then it all goes to pieces with an extended action set piece that grows more weightless and small the bigger, more destructive and depressingly weighty it becomes. Snyder spends much time lingering on skyscrapers tumbling in cringe-worthy bouts of collateral damage. Evenly matched superpowered beings slug it out around and, more often, through buildings of all shapes and sizes for extended periods of time, zipping away while debris falls and massive structures collapse. There’s such an overpowering sense of seriousness that we can’t even luxuriate in the serious silliness of it all, the spandex, scene-chewing mythos that should be able to carry us through. Instead we have to pretend yet another sequence of violence erupting around a world-ending alien laser beam shooting into the sky in the center of a cityscape is something we haven’t seen twice a summer for half a decade. The film is both too much and not enough. I loved seeing Superman on the big screen again, but found myself wishing it could have been in a film that did more than satisfy the basic demands of a summer blockbuster: percussive score, excessive property damage, recognizable symbols, muddled ideology, self-seriousness. Sitting through the protracted climax, it all felt so endless. But by the time the credits rolled I found myself thinking, “That’s it?” After over two-and-a-half hours, I realized I knew the characters, but I barely knew these characters. It’s a film that plays with iconography and summons all the best that Superman can offer, before leaving it thin and pushing it aside to give us a big, repetitive superpower slugfest that’s just like any other grim, grey blockbuster conclusion. Maybe they’re saving the really inspiring stuff for the sequel. Studio Ghibli, the beloved Japanese animation studio best known for its fantasy masterpieces like Hayao Miyazaki’s Spirited Away, My Neighbor Totoro, and Castle in the Sky, has an impressive track record. So sharply observed and deeply felt, these films are special in the way they have an instinctual feel for characters’ internal lives and daily routines expressed through meticulously gorgeous animation that’s beautiful in both design and gesture. When making a film that’s considerably more realistic in approach, like the harrowing World War II drama Grave of the Fireflies or the tender young romance of Whisper of the Heart, this asset can been seen clearly. Take away the fantasy and their films are still full of magic. 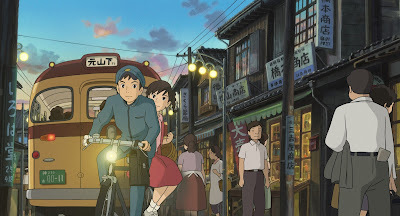 Ghibli’s latest film to hit American shores is From Up on Poppy Hill, a gentle, observant film with drama kept decidedly small, sweet, and casual. Much like the studio’s earlier human dramas, this is a film that takes plots that could seem stale and lets in fresh air by providing breathing room, space for stillness, pauses of atmosphere and tender emotion. With a light dusting of nostalgia in the imagery, Poppy Hill takes place in the early 1960s in a small seaside Japanese town. The main character is Umi, a girl who lives with her grandmother and helps run the family’s boarding house. The building contains a number of characters briefly but evocatively glimpsed, a collection of women young and old who encourage one another and are as much friends as landlords and tenants. The film is mainly concerned with the girl’s routine, going to school and rushing home to work. Every morning she runs signal flags up the building’s flagpole, a habit that keeps alive the memory of her father, a sailor who died in the Korean War. She yearns to know more about him, but her mother is away studying in the United States. This develops into a softly, richly felt subplot. Life moves forward. A tentative romance starts between the girl and a charismatic schoolmate. The boy and girl are feeling the first blushes of puppy love, strong enough to pull them towards each other, but unspoken, so that rather than being together for the sake of being together, they must find other, more practical reasons to meet. Other subplots include the boy’s interest in his family’s past and their schoolmates’ struggle to save their historic clubhouse from certain doom at the hands of the school board. Many of these plot threads center on the kids, the first post-WWII generation, looking to apply knowledge and lessons of the past in their present and future. The film, alive with period music and subtly rendered detail, works calmly around its theme of memory. What makes all of this work is the patience with which it plays out. One character, dismayed over a new piece of information, bemoans that it’s like something out of a “cheap melodrama,” but the film never feels emotionally chintzy. It’s too willing to take the time to let characters feel a multiplicity of emotions, respond to more than one motivation, feel inner conflict that leaks out into their behaviors. An early moment, so fast you might miss it, is indicative of the film’s typical Ghibli touch for allowing close observation in its animation. Two girls approach the boy-dominated clubhouse and ask a simple question of two boys hard at work. When the boys respond, their cheeks gain subtle bright smudges of red. They’re both excited and embarrassed by the prospect of talking to girls. It’s a nice throwaway detail that’s hardly necessary but makes all the difference. The film, co-written by Hayao Miyazaki and directed by his son Goro, feels consistent with the studio’s house style of emotionally engaged visual detail. There’s something refreshing about a film that’s so confidently small, so willing to simply sit with its characters in their world and see what happens. Though the narrative gently pulls them along, there’s a sense that it’d be just as well if it didn’t. Per usual, Ghibli delivers an animated film with a sense of place and purpose that unfolds at a welcome unhurried pace. It’s practically a guarantee that even a minor Ghibli effort, as this is, will be better than most animated features you’ll see in a given year. You can almost see the good version of This is the End within it, which makes it all more disappointing this isn’t that. The concept’s solid. Some celebrities are having a party at James Franco’s house when the apocalypse happens. That’s kind of funny, right? What follows is a film that’s entirely too self-satisfied and cripplingly indulgent, resting for far too long on the audience’s assumed delight at watching recognizable faces play themselves. The only truly apocalyptic aspect of the film is the feeling that we’ve well and truly gone past the point of caring about the umpteenth narrative of stoner manchildren haltingly realizing they need to grow up. 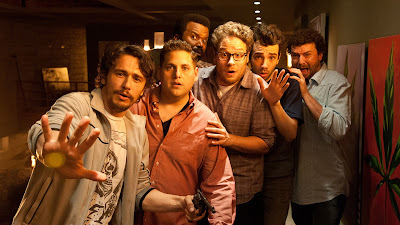 If This is the End should represent the end of anything, it should be Seth Rogen, Jay Baruchel, Jonah Hill, and the others putting aside this played out character arc once and for all. Filled with the gentlest of self-critical mockery and hyperbolic play with personas, the film is, for the most part, locked up in Franco’s mansion while fiery Armageddon rages outside. The opening bit of spectacle swallows up a bunch of welcome cameos and scoops up extras in the Rapture, leaving us with Franco, Rogen, Baruchel, Hill, Craig Robinson, and Danny McBride huddled together with dwindling supplies. They fight over survival strategy, have extended comic riffs, and develop spats extrapolated out of their fictional relationships. As is to be expected with this group’s standard R-rated comedy routine, there are endless gross out gags, cultural references both obscure and obvious, and lengthy conversations about every natural bodily function and a few unnatural ones as well. It’s rarely surprising, even at its most unexpected. This has been written and directed by Rogen and his long-time writing partner Evan Goldberg. It’s pretty clear that every bit of the film is a result of a funny (more likely funny at the time) idea that either they or a member of the cast fumbled their way towards during some session of brainstorming or improvising. The result is an uneven experience, sometimes funny, usually not, as if a sloppy dorm room thought experiment has somehow made it to the big screen largely unchanged. Like, dude, what if the world was ending? And what if we hid in this house? Like, you’d be like this and I’d be like that and, oh man, you know so-and-so would totally die right away. But the difference between engaging in this kind of freewheeling teasing in a hypothetical scenario with your buddies and doing that but for a worldwide audience of moviegoers is that when a major studio bankrolls you, each dumb digression is literalized. You might think suggesting a friend would eventually get possessed and projectile vomit demon juice is a funny idea, but when seen on the screen, there’s a good chance it’ll look like overkill at best, an inside joke at worst. And so it goes here, over and over again. I’m mostly frustrated with the way the creative energies behind this movie conjure up world-ending stakes and then use them to only poke soft fun at their public personas and circle the same tired types of jokes they’ve been making in film after film for years now. It could be funny to take a celebrity perspective on disaster. It gets there a couple of times, like when Jonah Hill says he’d expect celebrities to be saved first: “Clooney, Bullock, me, and, then if there’s room, you guys.” But the film dwindles away into disconnected silliness that grows tedious as the claustrophobic minutes tick by, the guys repeating the same basic actions and tics. When the group finally gets out of the house, the energy picks up with the kind of surprises and surprise cameos this thing could’ve used more of. But by then we’re in the last ten or twenty minutes of the picture and it’s all too late. The movie is just a big concept filled up with small ideas, inadvertently saying the only way these guys will grow up is through the intervention of God himself. The Internship is an amiable hangout movie. It’s little more than a chance to spend time with an appealing cast playing pleasant types. At the center of its appeal is the duo of Vince Vaughn and Owen Wilson, reteaming for the first time since their successful 2005 comedy Wedding Crashers. They’re both fast talkers, but where Vaughn muscles through with nonstop bravado, Wilson has a spacier syncopation. When both motormouths get up to speed, they find a fine, easy rhythm. This new comedy finds them surrounded by a capable cast that rises ever so slightly above glorified reaction shots in a plot that’s loose to put it generously. And yet I found myself enjoying sitting with this film much more than Crashers, which I’ve always found to be a tad on the grating side. I didn’t realize until I saw this one that my biggest problem with the earlier film was all that pesky plot. Sometimes a good, agreeable hangout is just what’s needed. As the film begins, Vaughn and Wilson lose their jobs when the company they work for closes. Desperate to find better prospects, they bluff their way into summer internships at Google, where they quickly find themselves bewildered on the wrong side of a generation gap. The interns are placed into teams and the kids – a young manager (Josh Brener), a cute collegiate nerd (Tiya Sircar), a too-cool-for-school dude (Dylan O’Brien), and a self-conscious, socially awkward computer whiz (Tobit Raphael) – who get stuck with the old guys are none to happy about it. They’re an awkward bunch, but if you suspect they just might eventually, reluctantly learn to love each other and work as a team by using each member’s best skills you’d be on the right track. The team that wins the most points in various challenges over the summer, everything from coding to Quidditch, will win jobs at Google. Nods toward typical slobs (our protagonists) versus snobs (led by Max Minghella) plotting, as well as the basic competitive drive, make up the movie’s loose throughline. It’s not often you find a light, summery comedy about how terrible the job market is. For a while, I remained unconvinced that it would work. But a funny thing happened as I sat there and let the movie play out: it won me over. The way the script by Vaughn and Jared Stern locates the anxieties of the two leads right inside the generation gap – they’re too young to ignore technology, too old to fully “get” it – becomes a somewhat productive dialogue. They grow progressively open-minded about younger people and new ways of doing things, while their teammates grow more open-minded about the value of input from people with more of an old school skill set. It’s a soft movie, but a few of the points it dances around are more perceptive than I anticipated. There’s a nice moment where Wilson and Vaughn chastise the younger interns for being so cynical about their future careers and when the response comes – “Do you even know what it’s like to be 21 today?” with a college degree no longer guaranteeing a job, if it ever was – they’re actually taken aback and consider it. None of this would work without the cast. Director Shawn Levy, of Cheaper by the Dozen and Date Night, keeps the scenes casual and sociable, letting the ensemble fall into comfortable grooves to fill the scripted sequences with a bit of a loose feeling. Vaughn and Wilson have a relaxed chemistry that’s very appealing. Various supporting roles filled by the likes of Rose Byrne, Aasif Mandvi, and Josh Gad are fine bits of color around the edges. I was most taken with the work of O’Brien and Sircar, two of the college-aged interns who spar and banter with the main guys. Their winning performances are charming and feel like they’re circling some sort of generational truth, mediating their experience through smart phones and admitting to a technologically enabled imagination that’s wilder and more experienced than their real world lives to date. This isn’t anything great, but it’s sweeter than expected. It’s refreshing to find a big studio comedy that’s just plain nice. (It’s also likely the only Hollywood comedy you’ll see in some time to purposefully allude to a Langston Hughes poem.) The movie hates jerks, lets characters feel bad about bad decisions, and angles for encouragement and hope above all else. It’s miles more humane and watchable than Ted or The Hangover Part II or any other corrosive-yet-popular comedy of the past several years. If this core decency leads the film into its biggest misstep, so be it. The approach to its setting feels miscalculated, so dewy-eyed about how great it is to work at Google – just shy of Wonka in the whimsy department, if the production design filled with pedal-powered conference tables and nap pods is to be believed – that it shoots past elaborate product placement and ends up feeling like it’s having a goof. Still, this is a movie that’s enjoyable to be around. Simply spending time together may not actually solve generation gaps, but it’s nice to think so for a couple hours. The Purge is a sociological thought experiment in the guise of a home invasion horror movie. That wouldn’t be so bad if the central thesis weren’t so ridiculous and obvious. The film imagines that by 2022, the United States will have dropped crime rates down to record lows by instituting an annual catharsis. For the next twelve hours, as of the start of the movie, all crime is legal. (“Including murder,” the emergency alert broadcast helpfully (?) reminds.) And just what does writer-director James DeMonaco think would result from this hypothetical time of total immunity? Nothing good, that’s for sure. This imagined world accommodates a night of chaos in return for a completely peaceful 364 days. The movie posits not so controversially that a society without rules of any kind would probably be bad. Ethan Hawke stars as a wildly successful home security salesman. That makes sense. I guess if the country is going to explode in looting and murder one night a year, the sales of home security installations would naturally skyrocket. As the movie starts he and his wife (Lena Headey) have holed up in their large home with their daughter (Adelaide Kane) and son (Max Burkholder) to wait out the purge. It’s an issue of class. Those who can afford the protection ride out the night just fine. Those who can’t afford to keep themselves safe – the homeless, the poor, and the marginalized – are the ones who end up dead by dawn. Talk about class warfare. As you might suspect, things inevitably go wrong for Hawke and his family. It all starts when the son shows some compassion and opens the steel barricades to let a homeless man (Edwin Hodge) hide from a roving band of purging youths. The clean cut, prep schoolers stride up to the front door and demand the return of their prey. Their blonde, blue-eyed leader (Rhys Wakefield) presses his face into a security camera and says it’s their right to kill the man. He’s not contributing to society and they have pent up violent impulses. Win-win. The young man speaks with the entitled swagger of a spoiled kid who it’s easy to imagine thinks reading Ayn Rand has explained the way the world actually works to him. The crowd stalks around the mansion’s perimeter, banging on windows and steel doors. They shout an ultimatum: give up the homeless man or they’ll come in and kill them all. The tidy plot quickly grows tedious as DeMonaco tries to wring much tension out of the power getting cut and the family and their unexpected guest wandering around in the dark, hiding from each other, getting separated, and fretting about what to do. It feels like much of the runtime is given over to Hawke and Headey apparently getting lost in their own home running down dim hallways, waving flashlights, and shouting endlessly for one or both of their children. Charlie! Zoey! After awhile I felt like maybe if I shouted too we could find them and get on with it. (Only a sense of good theater manners kept me quiet.) The danger should feel real. It would be terrifying to be trapped in your own home with a total stranger hiding somewhere in there with you, consequence-free violence and certain death awaiting you just outside your own front door. But the whole thing feels so ephemeral, a clearly ridiculous concept embraced only as an inciting incident without thinking through the total implications of the central idea. What kind of government would set up this purge? We hear fleeting references to “the new Founding Fathers” and see widespread acceptance of the purge. How did we get here? Whose purposes does this really serve? There’s all kind of intriguing political allegory that could easily be found, but instead the whole thing grows muddled. Hawke grabbing increasingly more powerful weaponry to fend off the purging hooligans gathering outside feels like a stand-your-ground apologia, where armed good guys struggle against, well, armed bad guys, and no matter what anyone does, the cops won’t care come sunrise. Meanwhile, the us vs. them, haves vs. have-nots subtext that rapidly becomes simply text reads as a hyperbolic argument against total deregulation. This is nothing more than a dimly lit, repetitively dumb little thriller that fails to satisfy politically or on its own genre terms. Sarah Polley’s Stories We Tell is not a documentary about her mother’s life story. It is a documentary about the stories about her mother’s life. That’s a key distinction. Rather than becoming a simple biographical exploration, Polley puts family members and family friends in front of her camera to tell their recollections and impressions of her mother, actress and casting director Diane Polley, who died of cancer in 1990. This is a movie about how a family reconstructs the memory of a lost loved one and how a family defines itself by the stories they tell about themselves. It’s achingly personal and inherently sloppily complex, but, recognizing that personal detail is just that, personal, Sarah Polley has created a film about itself as well. She reconstructs the facts, as best she can, but also engages both implicitly and explicitly with the question of who can ever really know the truth. Each person involved in the film has the truth they know, with which they’re, if not comfortable, than at least used to. In making the film, Polley, as generous as she is in allowing for each interview to speak and be heard, has inevitably put just one more interpretation into the world. Though all people, one assumes, are carrying some number of secrets, it is soon apparent that Diane had perhaps a few that are bigger than most. We start with her husband, the person who presumably knew her best. As the film begins, Polley invites that man, Michael, the man who raised her, into a recording studio. She places a thick stack of pages filled with writing in front of him. He begins to recite what we quickly come to understand is his story of his relationship with Diane. He becomes our narrator, linking the varied memories revealed by Polley’s brothers and sisters, aunts and family friends. We learn about Diane through their eyes, but it begins to take on the feeling of literary analysis. To hear them talk about her is to hear discussions similar to what one might hear in an undergraduate course discussing a novel’s main character. Repeated motifs of her life are picked apart for their implications. Actions become rich with ambiguity. Emotion and ambition, spoken and, more often, unspoken, are read carefully. Of course, by virtue of being a real person and not text on the page, these readings are mutable and fallible in ways for which only subjective personal experience can account. The film is a massive, tricky undertaking that anyone who has sat around a table with loved ones and found contradicting memories behind famous family stories can relate to. That Stories We Tell not only doesn’t fall apart, but grows richer and more intriguing as it goes along is something to be commended. It feels long, but Polley earns her film’s pokiness and digressions. As the story, augmented by archival footage and strategic reenactments, comes into clearer focus, as some mysteries become not so mysterious at all, as the facts lead only to unanswerable questions, it’s clear that this family’s story is one that is both complicated to an observer and simple to those living it. It’s only when they’re forced to stop and think about it, by revelations they’ve recently discovered and through the act of making this documentary, that the attempt to draw a clean narrative arc fails and they’re left seeing the complications of it all. In the end, those who knew Diane are left wondering, “Why did she do what she did?” and “What was she feeling?” While these questions are worth pondering, they are also meant most for her family alone. Polley makes no effort to solve these unsolvable riddles. Instead, she concludes with a section of film devoted to the participants reflecting upon the very nature of the film. One man, in particular, is a bit reluctant to allow his version of the story to be juxtaposed with others’. His is the version of the story that fills him with satisfaction since, after all, it is the way he experienced his life as it happened. In the end, it is the man who raised her who says that, as writer and director, it is Sarah Polley herself who is controlling this story. Her camera has taken in all views. But by deciding who gets heard saying what when, she has ultimate say. This is an unresolved tension that Polley leaves open, a nagging and tantalizing loose end every bit as rough and deeply personal as the stories her family tells.